This interesting name is locational in origin from at least one of eight villages called Holland, in various parts of English, including Lincolnshire, Essex and Lancashire, all of these derive from two old pre 7th Century English words "hoh" meaning a ridge and "land" meaning land on or by the spur of a hill. 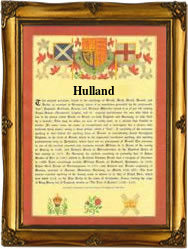 Variant forms of the surname have included Hollands, Howland, Hewland, Hulans and Hoyland etc.. The surname has emerged by the early 10th Century (see below). There is a record in Lancashire Assize Rolls of a William de Holaund (1246). In Shropshire, one William Hulland married Alice Kings on June 22nd 1612 at Ludlow. The Holland is occasionally derived from it's use as an ethnic byname for a person from Holland or from an Anglicized form of the Old Gaelic O' Maolchalan (devotee of St. Calann). The first recorded spelling of the family name is shown to be that of Begmundus de Holande, which was dated circa 975, The Early English Records, Essex, during the reign of King Edgar 959 - 975. Surnames became necessary when governments introduced personal taxation. In England this was known as Poll Tax. Throughout the centuries, surnames in every country have continued to "develop" often leading to astonishing variants of the original spelling.